Shorts Brewing Company is rapidly gaining a strong following among Michigan beer geeks over the past couple years as their production has moved well into a couple thousand barrels per year, well beyond the hundred or so brewed in their first year. Founded by Joe Short in 2004, the company has become a family affair as his now wife Leah runs the deli and food portion of the business and Joe concentrates on sales and production as they’ve expanded from their original hardware store into a production facility. Located in the small northern Michigan resort town of Bellaire, near Torch Lake, it’s pretty much “in the middle of nowhere” but has, nonetheless, managed to gain a foothold throughout the north and west sides of the state and beyond. Their beers are bold, passionate and flavorful and their pub and live music scene is rollicking, particularly in the summer season. While I’ve always enjoyed their beers, I’d never really “reviewed” one as they never tend to be much for style accuracy. Heck, their offerings are typically tough to actually even define, much less get into style. Their Pontius Road Pilsner is one of those beers. Offered on draft only, the PRP is described as “true American pilsner,” which is somewhat akin to Miller Lite’s claim, albeit in a completely different direction and for completely different reasons. It’s does pour pale and clear, but it strikes me as more of a helles than a pils, although it’s flowery enough to even doubt the lager yeast. It’s very mildly hopped, with little of the crispness one might expect in a pils. The body is sweet and full, with a gorgeous full white head. There is a mildly dry finish and, unfortunately, a hint of DMS, although nothing more than a Rolling Rock would consider distinct. As one of their tamer offerings, this would make a great session beer and pair nicely with almost any tomato dish, especially anything highly seasoned or spicy. While not within style, this is nonetheless a very enjoyable brew and is recommended. As I’ve mentioned previously, Bobby Mason’s Michigan Brewing Company is a favorite oasis on a road trip as a refreshing trip to the tasting room is a perfect break on the way east or west. Today, I decided to sample their Little Prince, which is described as the second runnings of their IPA … so more or less a “light” imperial pale ale, in the non-FDA sense of the term. Bright orange in color, the Jack has a huge, flowery and hoppy nose, but without the huge hoppy bite. It’s body is a little thinner than their regular High Seas IPA offering and the finish is long and dry. This would compare to some macro-IPA offerings out there and certainly isn’t bad. It suffers a little bit from a lack of balance due to the lighter malt body, but is definitely quaffable, without being too big. This one’s solid, although many hopheads may enjoy it even more than that. On this trip, I decided to go with their “famous” Celis White, the choice of my lovely road trip partner as she’s partial to the wit beers. Celis is a pretty interesting tale. According to the Austin Statesman, “As a boy in his hometown of Hoegaarden, Pierre Celis enjoyed and from time to time helped brew witbier, a light-bodied, refreshing beer brewed primarily with wheat. This white beer, so named because the yeast suspended in the liquid made the beer look cloudy or milky white, had been losing favor locally to German-style beers made with malt that were filtered clear of yeast. By the end of the 1950s, not a single brewery in the Province of Flemish Brabant produced the 500-year-old witbier style. In 1966 Celis, a milk distributor at the time, decided to make a witbier for himself at home. He used the traditional ingredients, water, yeast, wheat, hops and coriander and dried Curacao orange peel for spice. So satisfied was he that he eventually opened a small brewery. Witbier was a forgotten pleasure Belgians eagerly welcomed back. At the age of 60, Celis had money, time and options. By the early ’90s, he founded Celis Brewery in Austin, the state capital of Texas, as microbreweries became legal in that state. The brewery was operated along with his daughter and son-in-law, and expanded quickly. Eventually, they partnered up with Miller Brewing Company to gain distribution access and production expansion in the competitive world of U.S. brewing, the so called Beer Wars. This partnership soured, however, even as Celis White, Grand Cru and other brands were winning major brewing awards throughout the ’90. Eventually, he sold out to Miller, who in turn closed the Austin brewery and shut down the brand. In 2002, Michigan Brewing Company acquired the brands and moved production to its Webberville facility, where the White, Cru, and Raspberry live on. Celis White has a mild citrus nose and pours pale yellow in color with a nice full head. The body is crisp and tastes are effervescent on the tongue as the carbonation exaggerates the orange and spiced flavors. There’s a light, hoppy bite and the flavors round out smoothly with a hint of banana and cream, along with the citrus fruitiness. It’s delightful and surprisingly complex for a lighter brew. This is a fine effort by Michigan Brewing to continue the tradition of Pierre Celis. On this trip, I sampled a few “seasonals,” beginning with a pint of Fred’s Old Ale, a winter warmer to kick start summer. Fred’s Old Ale is a robust caramel in color and looked nice, aside from a very thin head nearly absent of foam. While this is not entirely unexpected in an English-style ale, the nose was nearly as flat, only a slight bit of sweetness in the aroma. The first taste was even sweeter, as this brew is very malty—almost too malty—with nary a hop nose. It does, however, drop off into a long, bitter finish. There was a hint of metal in the middle of the palate. The weather was probably too nice for this one, but it was largely unsatisfying nonetheless. While not a bad beer, it lacked balance as its malty flavors and extreme dryness were flat and pronounced in opposite directions. In other words, there was nothing exactly in harmony and the results were borderline unpleasant. Obviously, this is a difficult find, but it’s certainly an interesting pour after a half dozen or more years. The following are true conversations I’ve overheard or participated in. Crawford Lake Inn, in Michigan is the scene, with a large dinner party on the deck overlooking a lake. A man in a moustache is working on another Heineken Light, when a younger man in a college t-shirt starts talking to him, while drinking a PBR. He pauses, considering the flavor. A Minneapolis dive bar is the location, with live music, tasty burgers, and a wide variety of beers. Geek #1: “You should talk to him.” He nods, indicating his companion. Communist guy looks down at his shirt. Communist Guy looks at his beer. Now we’re at a Grand Rapids downtown chain bar, with 24 tap handles. A beer geek is looking over the tap handles and is approached by a pushy sales woman, who has recently become a sales manager for the local Budweiser distribution house. She’s hovering over anyone at the bar—where she used to work, by the way—to buy a Bud or Bud Light. She’s not buying, just imploring them to buy her beer, now that she works there. She knows the beer geek from her previous employment has never consumed either of those beers. I just walked in to a Chicago area brewpub, where I was regular for a time, and approached the bar. I order the latest seasonal when another patron walks up. The Bartender turns back to the bar and the handles. I can see what he’s doing, but the Patron cannot. The bartender fills the pint glass about 1/3 with soda water, looks back at me, and then tops it off with their lightest ale. The Bartender sees me laugh. He brings the pint back to the bar, where the patron pays him the exact amount. The patron turns and walks away. Wow … this one was a surprise. New Holland has staked their reputation on big, flavorful brews, typically leaning in the English direction, and that’s what I’ve come to love and expect from them. While they do have a few Belgian varietals in the portfolio—Zoomer Wit most readily jumps to mind—those alternative efforts have really never struck me as anything special. 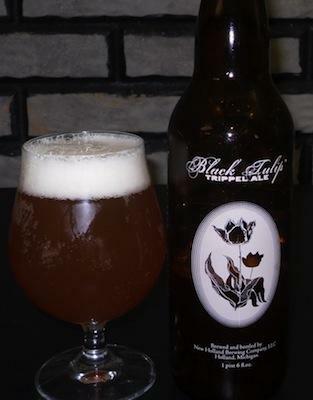 After checking out a somewhat disappointing effort last time from Leelanau Brewing Company and Ron Jeffries, I dug into New Holland’s Black Tulip Trippel Ale, not expecting much … but found it instead to be much better. The same estery nose jumps out as it pours a deep golden color. A disappointingly light head led me to believe this effort would again prove lacking. However, the first sip washed away my initial doubt as a nice full body follows up the fruity banana and clove aroma with a malty sweetness and rolling, complex, yeasty finish. It gets even more fun as it opens up throughout my meal, but maintains a consistent and interesting balance of fruit, malt & esters. This balance is particularly rewarding considering the 9.0 ABV and 16.9° Plato heft. It doesn’t give you a burn, just a soft warmth, which may play dangerous by the second pint if one is so inclined. I was delightfully surprised, especially considering this was a New Holland effort … not that they don’t make fabulous beer—because they do—but because this was so much better than many of the so-called “Belgian-style” micros out there.